SCP-3654 being lead to Naval Site-821. Special Containment Procedures: Naval Site-821 has been built on Otōto-jima and has been staffed with personnel experienced with repair and restoration of World War 2 Era watercraft. Staff should patrol the waters around the Chichi-Jima group of islands to search for SCP-3654. If SCP-3654 has not been found by the projected date, search teams are to be sent to the other island groups in the Bonin islands. Once SCP-3654 has been found, it is to be towed or escorted to Naval Site-821, where it will be repaired and refueled. Items found within its cabin should be documented but left undisturbed. 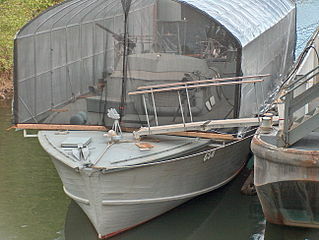 Before SCP-3654's projected disappearance, munitions and rations are to be placed on the boat. Personnel who wish to add extra-dimensional sensors to the vessel should speak with the current project supervisor. Description: SCP-3654 is a possibly alternate version of the PT-658, a World War 2 era motor torpedo boat. The vessel displays wear consistent with several decades of continuous use. The interior of SCP-3654 has living quarters for eight men, with the remaining bunks turned into additional storage areas. Personal effects within the vessel indicate it is crewed by American soldiers, however the language present on the written documents and signage is in an as of yet undecipherable language. Maps found in the captain's quarters indicate SCP-3654 is or was part of an invasion force planned for mainland Japan. The primary anomalous trait of the vessel is a cycle of existence and non-existence, each lasting for approximately 29 days. When SCP-3654 disappears, no living organic matter will transport with it. On multiple occasions, it has shown to be capable of autonomous movement without the use of its engines. SCP-3654 was first discovered in 1978 by a civilian science vessel that was exploring the Bonin Islands. At the time, it was heavily damaged, with two of the three engines out of commission. The vessel was covered in makeshift camouflage that was composed of packed mud and decaying plant matter. An initial analysis of SCP-3654 revealed a significant amount of crushed or broken timepieces and clocks sitting on a pile of partially burnt calendar pages. Chalk markings, possibly counting number of kills, have been noted next to the defensive turrets. Addendum: Notable changes to SCP-3654 or the items within it have been recorded and listed below. Notes: Bunk #7 was found emptied of personal effects save for a picture of a soldier, several bottles of alcohol, and a small pile of dried tropical flora. Notes: The chalk markings next to the defensive turrets increased dramatically, rising from an average of 6 marks to 27 marks. Notes: A note was found wedged near the vessel's wheel. It contained symbols and pictures that appeared to request munitions and food. The containment procedures were appended to include these materials following a testing period. Notes: Following the implementation of including rations when SCP-3654 disappears, another note was found near the vessel's wheel. The pictures depicted crude drawings of Japanese boats on fire, and the image of a clock. Notes: The sundial was found missing, but the markings remained. Investigation of the ship revealed the palm trunk broken into pieces and hidden under Bunk #8. Notes: Multiple crewmen on the ship appeared to have moved their sleeping quarters nearer to the engine. A chalk line was drawn halfway between the bunks and the new sleeping area. Notes: The captain's quarters were found ransacked. A destroyed pocket watch was found in the center of the cabin. Notes: A barrier constructed of palm trunks with metal bars was blocking access to one of the cargo areas. Multiple bullet holes were found in the barrier. Behind several of the cargo containers, a paper calendar was discovered, with a large number of dates randomly crossed off. Notes: Multiple shrines and pyres were discovered in burnt or semi-burnt states throughout SCP-3654. Notes: The interior of the ship became covered in a massive amount of hand drawn clock faces, calendar pages, and symbols from their written language. Notes: SCP-3654 was found in a small cove and appeared to have been intentionally scuttled. A large dark-brown stain, later discovered to be blood, was found in the center of the deck.